Tightwad Terror Tuesday - the best free movies on the web. Feature Image by Chris Fischer. What We Do in the Shadows (2014), courtesy Unison Films. We’re going to start featuring titles that are on a different kind of free streaming service, and it may take a bit of explaining. The website is Kanopy.com, and it will require you to register and authenticate with a library card. Not all libraries are part of it (yet), but those in big cities and most university libraries will get you in. Kanopy is worth the extra trouble, though, because it has tons of great free movies. Movies like What We Do in the Shadows. What We Do in the Shadows is a faux-documentary that follows a group of vampires around as they go about their day-to-day (or night-to-night, as the case may be) activities. The film was written and directed by Jemaine Clement and Taika Waititi (who both also star in it), so it’s got more laughs than scares, but it makes excellent use of the found footage method of filmmaking, and it’s about vampires and werewolves. If you want to see one of 2014’s best movies, What We Do in the Shadows waits for you here at Kanopy. A Girl Walks Home Alone at Night (2014), courtesy Kino Lorber. And speaking of vampires…A Girl Walks Home Alone at Night is about an Iranian town called Bad City that is filled with desperate criminals and hopeless drug addicts. As if that isn’t enough despair, Bad City’s citizens are also being stalked nightly by a murderous vampire. Directed by Ana Lily Amirpour and starring Sheila Vand as “the girl,” A Girl Walks Home Alone at Night is an art film hidden within the shell of a horror movie. This 2014 tale of loneliness and isolation was purposefully shot in black and white, and although it was made in America, it’s in Persian with English subtitles. For what it’s worth, it’s often billed as the first Iranian Vampire Western. See A Girl Walks Home Alone at Night here, also at Kanopy (I told you it was worth the trouble). Tormented (2014), courtesy Vertical Entertainment. 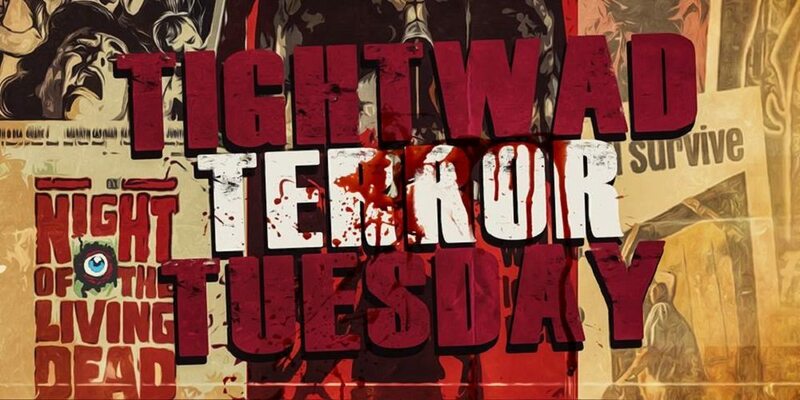 Not be confused with 2013’s Torment, which Tightwad Terror Tuesday covered a few weeks back, or the other 1960 Tormented, which we covered a few years back, or even the 2009 Tormented, which we haven’t covered at all (yet), Tormented is a 2014 movie about a babysitter who is, well, tormented, by a group of people wearing pig masks on Halloween night. Originally called Berkshire County (which is a much better name, considering all of the other Tormented movies that are out there), Tormented is a fairly typical home invasion/survival slasher along the lines of You’re Next and The Strangers. If that’s your thing, you can catch Tormented right here at TubiTV. River’s Edge (1986), courtesy Sony Pictures Home Entertainment. River’s Edge is about a high school loser who kills his girlfriend. He shows her body to his circle of friends, and their reactions go from frightening ambivalence to fierce loyalty in helping him cover up his crime. Made in 1986, River’s Edge is one of those deeply unsettling coming-of-age movies. It boasts a who’s-who cast of future and present all-stars, including Keanu Reeves, Ione Skye, Crispin Glover, Dennis Hopper, Roxana Zal, Daniel Roebuck, and Joshua John Miller. As a horror movie, it’s pretty fringey, but as a work of cinema, River’s Edge is a must-see. And you can see it here at Vudu. #FollowFriday (2016), courtesy The Asylum. #FollowFriday is about a college campus that is plagued by a serial killer who targets his victims through their social media accounts. Cutting edge, yet so overdone. It’s an Asylum production mockbuster, but it’s hard to tell if #FollowFriday is trying to rip off Friend Request or Unfriended. Either way, like most movies that are built around technology, it’s dated, so if you’re going to watch #FollowFriday, watch it fast. You can do that right here at Crackle. Want more free movies? Check out previous Tightwad Terror Tuesdays right here. Feature image courtesy Chris Fischer.